LOOKS LIKE EVERYTHING IS THERE TO COMPLETE THIS - INSPECT IN PERSON. 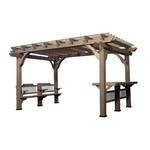 The 10 ft. x 14 ft. Pergola is sure to complement the look of any space. Entertain guests and enjoy time with friends and family while sitting around the bar. Leave the pergola as is with its natural, stylish design or decorate the versatile cedar wood with lights and accessories.